An Abu Sayyaf sub-leader and five members were arrested by the government troops together with high grade firearms: Three M16 rifles, two M1 Garand rifles, one M79 grenade launcher, and assorted magazines and ammunitions. Abu Sayyaf sub-leader Apan Apino alias Mudzrin was arrested in Barangay Sinulatan, Tuburan, Basilan Province. 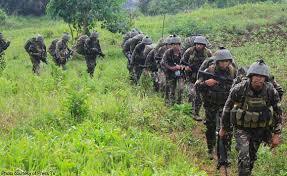 Joint Task Force Basilan led by Brigadier General Juvymax Uy said, that the bandits were “already tired of running away and evading government forces,” the military said, noting that “hunger and boredom of being away with their families” also prompted them to surrender.